Today the Diablo series celebrates its 15th anniversary. On November 30th 1996, Blizzard North unleashed Diablo I on the world. Yes it has been that long. A sequel and an expansion later we are now looking forward to the third game in one of the most popular game franchises ever created. It was not long after the release of the first Diablo that Elly created this very website. Starting out as a site to help customers in a gaming cafe, it was never intended to go online, but soon enough you guys found the site and it spawned into what we see today. All of us working on the site have been involved from the very first game so we are incredibly pleased that the series continues 15 years later thanks to the creative talent at Blizzard. Many congratulations to Blizzard, the current development team and also to all the developers from Blizzard North that have since moved on. Join us by raising your glasses to salute what is one of the finest game franchises ever created as we all look forward to many more years of Diablo gaming. Today also marks the 15th anniversary of my diminished productivity in school, work, hygiene, and life in general. A question to the veteran folks here: When was Diablo 1 EXACTLY released? Was it Nov 30, 1996 or Dec 31, 1996 because the Blizzard Legacy website says so? Nov the 30th I Think I got it for my Birthday (28th of Nov) the year it came out. 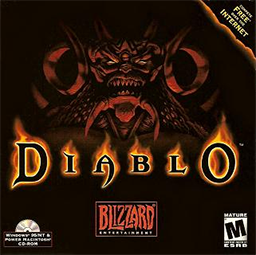 My older brother gave me Diablo when I was little… sure I was too young for it, but every monster I slayed back then made me into the unstoppable veteran I am today. I can’t wait to rekindle our demon-thirst on the midnight launch with him! Diablo was such a fun game to play with friends, I hope it continues on it’s legacy! Happy Birthday to the game that brought me to online gaming in the internet, guilds, teached me english … stole so many years of my life! It sure ‘teached’ you some good English. Give the guy a break, you nazi. You obviously are a genius who have mastered dozens of languages, judging by your attitude… or a hamster who didn’t learn one. Even among you people who desire English-speaking population decreased to themselves, we will always lurk undetected… People, who learned foreign language in video games, mastered it in email, and will use it to steal all your high-paying jobs. would you rather be speaking magyar at the end of a whip, like a slovak a century ago? perhaps you should get on your knees now, and thank the queen and franklin roosevelt for sparing you a lifetime of speaking german, russian, or chinese at the end of a barrel of a gun. C’mon the irony was funny. As for your overly sensitive comment, you might want to check the critics avatar..
DIABLO party, lets get wasted!! /raises a glass…here’s to Diablo and the many hours of fun we’ve had and here’s to many more. Thank you for creating this site, Elly, and for running it on a daily basis, Flux. I’ve spoken to you both in one on one conversations in the past – I’m positive neither of you remember – and you’ve been helpful and friendly. I joined this site the very week Diablo 2 was released and spent the first few years after the games’ release helping people in the forums. I currently am still playing the game, but after years away from it, now I’m receiving the awesome community’s help instead. I’ve met such great people here – unlike a lot of other forums, the members I’ve befriended here are nice and take part in legitimate gaming, which makes me very happy. Thank you for keeping the site up and supporting it for a decade and a half. Well put Mastavic. I second that. Thanks Elly and Flux. This website gives me as many memories as the Diablo itself, and may as well be the home screen that ships with every browser. Congratulations to Blizzard and to all of the fans and sites like this that makes these awsome games what they are! Cheers! i remember the release of Diablo like it was yesterday. I went together with a friend to the local Games-Shop and a long line was already waiting, i think the only game sold on that Day was Diablo. Diablo was actually a 1997 release by a couple of days. Congrats – too bad none of the team that worked on the original has worked at blizz for years, and most of them left almost a decade ago. So, gentlemen…shall we have a toast for this remarkable situation? Here’s to the game that impacted me like no other. It birthed some of my most fond memories in my earlier youth that I will NEVER forget. Through it’s unparalleled deep story, dark charms and mysterious atmospheres, it took hold of all our souls and made its way into our hearts. To the game that changed ARPG’s in a monumental way, and the Team that spawned it…Happy Anniversary Diablo and Blizzard North!! Full D3 intro cinematic at the Spike VGA, and – hopefully – the release date, too! There are good games, very good games, classics and games that define the future of the industry. Diablo was one of those future telllers. In 2000, Diablo 2 was released. It was bigger and better at some points. It was a classic. Now we wait for the third sequel which has not been developed by the Diablo team. Hopefully it will be a very good game.